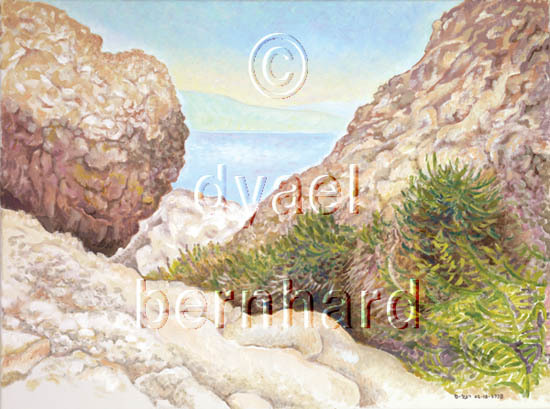 Dead Sea Wadi is the image for February in my new calendar, The Jewish Eye 5779/2019 Calendar of Art. This was a land of surprising polarities. The subtle outline of the hills of Jordan on the far side of the Sea, thin as veils – contrasting with the rough and wrinkled rocks with their dark cracks and bold shadows. The ancient stillness of the land paradoxically taking the form of wild organic shapes, with curves like calligraphy on burning paper. Once you start articulating these textures and shapes, they seem more like living coral than solid rock. Even the plants strangely resembled seaweed in this parched place that did not have a single cloud in the sky. It was all so unfamiliar, I was terrified to start – even working in the comfort of my home from a photograph – taken by me while visiting Ein Gedi nature preserve in Israel. My photo reference for landscape painting is best when taken for that purpose, with an eye toward what will enable me to remember my vision of the place. I brought this one up on my computer screen with no idea how I would proceed beyond the first step. But before that step was completed, the second step revealed itself – and so on. One must cross a room before the door on the other side opens – a phenomenon I experience more in landscape painting than anywhere else. I never know how I will proceed – yet almost always, the way reveals itself as I go. I need only find one more step I can take. As it turned out, this painting was one of the easiest landscapes I’ve ever painted. It slipped out with almost no effort, like a colt born in its caul. I never could have predicted that. The more I paint, the less I’m in control of what I do. Am I creating, or am I allowing something to create itself?